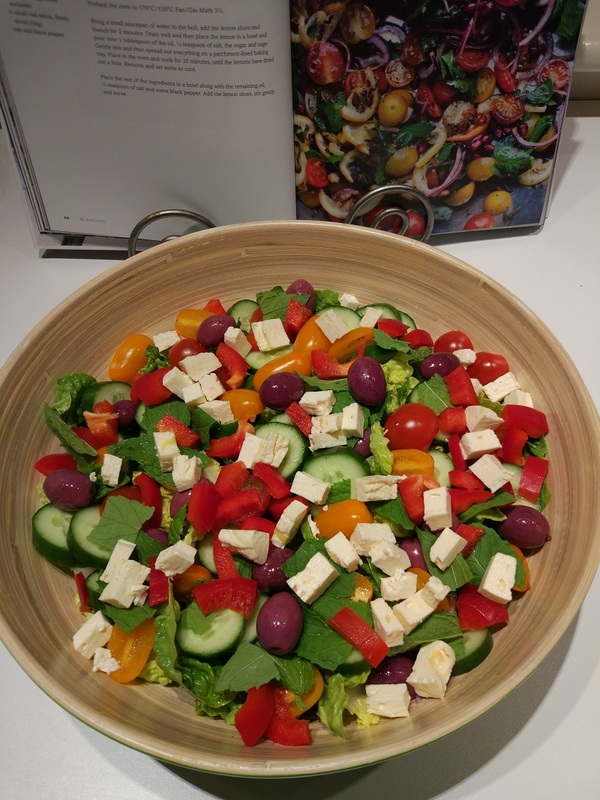 The humble Greek Salad is the focus for day five of of my seven day dinner inspiration to help you get back into the routine of cooking for the family after the school holidays. I’ve mentioned before in this blog series that when I cook (or when I prescribe foods for my clients) I always do it with simplicity, taste and nutrition in mind. One of my favourite dishes is the humble Greek Salad. It is quick to prepare and can be paired with almost any type of protein. It’s great with fish, chicken, lamb or beef. Or if you’re wanting plant protein, adding quinoa or cannellini beans works just as well. The key to a great Greek Salad is using fresh ingredients, good quality extra virgin olive oil and good quality feta. The basic Greek Salad usually has tomatoes, cucumber, black olives, feta, fresh herbs, olive oil and red wine vinegar. However, you can make this salad your own by adding whatever salad ingredients you like. I usually add lettuce and capsicum and if asparagus is in season I throw some in as well. Tomatoes, onions and olive oil are staples in the traditional Mediterranean diet which has amazing scientific evidence suggesting it is one of the most healthy food patterns in the world. Wash and chop salad vegetables. Combine in a large bowl with fresh herbs, olives, salt and pepper, and feta. Drizzle olive oil and red wine vinegar over the salad, and toss lightly. Once you’ve made your salad add a good quality free range/grass fed or wild caught protein like barramundi, lamb or chicken and you have the perfect nutritionally balanced meal.